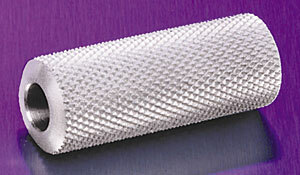 Anodized Aluminum - 5/8" x 1-3/4" with heavy knurling. Fits all standard tubes with 5/16" diameter. Attached by one 8/32" x 1/8" socket set screw (#1086E).